Good Food in Berlin will be joining forces with Berlin ♥ ’s You to bring you Berlin food that you will love! Today we hit the beloved and infamous Weihnachtsmärkte of Berlin. I love Christmas and I adore Christmas in Berlin. No other country in the world does Christmas so well as Germany, with their ever-present Weihnachtsmärkte most German cities, towns and villages. Shops, stores and companies go all out for the Christmas season and decorate their displays, windows and even toilets in a cosy Christmas theme. 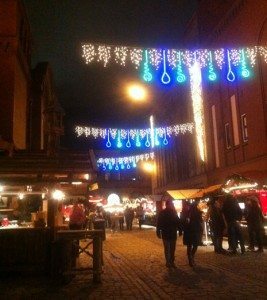 Visiting a Weihnachtsmarkt is a fabulous way to really be engulfed in pure Christmas atmosphere and to shop for nice holiday presents for your loved ones (or yourself). Germans like to visit Christmas markets too. Many working people like to pop out during their lunchbreak for a Bratwurst from the Weihnachtsmarkt, or they sneakily nibble on some sweetly fried dough (Mutzenmandel). Even when the temperatures drop below the -10, you will still see many stubborn Germans relaxing with a currywurst and Glühwein on a Christmasmarket. You may freeze your hands off, but that is all part of its charm. The Weihnachtsmärkte are my personal favourite when it comes to the season of jolly and holly. And that is why I will sum up some of the best, coolest and most ‘special’ ones ready for you to be visited. M y personal favourite Christmas market, in the middle of Berlin Prenzlauer Berg. I used to visit this market almost every day after work, for my pre-Christmas Glühwein fix. The Lucia Weihnachtsmarkt honours Scandinavian Christmas traditions and features many authentic Swedish, Norwegian or Finnish brews and nibbles. The market is located within the Kulturbrauerei’s backyard, which is filled with huge Christmas trees just for this purpose. The whole square – especially after an alcoholic drink or two – is covered in a magical and romantic blanket of lights, smells and atmospheric music. You can buy yourself a new fluffy hat or get your mum and dad some home-made culinairy delights to bring back home for Christmas. The stands are quaint little shops, with home-made Apfelglühwein, Christmas déco, Absinthe, Flammkuchen and wooden handwork. They also feature large decorative Christmas trees, a real ‘warmth’ iglo with an old-school wood-burning stove in the middle. Best drink around on the entire market: Apfelglühwein (mulled applewine) freshly produced by the Vom Fass shop in Berlin. The drink can either be consumed with or without a shot (Schüss) of Bratapfellikör, which gives it that extra twang much-needed on cold and freezing wintery nights. Vom Fass also offers some nice try-out nibbles that you can dip into their home-made sauces, oils and vinegars. Even though it is a bit more hidden away behind the caroussel, it is definitely a worthy stop on your christmas brawl. Convinced yet? The Lucia market opens every day at 3 o’clock, 1 o’clock on weekends and closes around ten at night. Walking distance from the Eberswalder Straße and in the Kulturbrauerei. 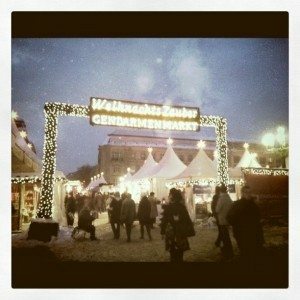 The market’s last day is on the 22nd of December: so drink your Glühwein here while it’s still hot! One of the absolutely prettiest Weihnachtsmärkte in Berlin is the well-known tourist attraction Christmas market on the Gendarmenmarkt. And not without reason, this large market is simply stunning and offers its visitors a great and varied assortment of drinks, foods and potential Christmas purchases. The area taken up by the market is located directly in front of the elegant church on the Gendarmenmarkt and filled up with many huge christmas trees, completely decorated with bright shining light. You will have to pay 1 euro entrance fee, but I can only say: it’s worth it! Try a freshly baked (and still warm) Flammkuchen with cream, onions and bits of bacon. Tastes like heaven after a couple of hours outside. Drink Glögg, a Swedish hot alcoholic drink, filled with almonds and raisins. Sweetly spicy and will warm even the coldest toes. Try cream cheeses in all variaties right in the middle of the market. A stand here offers cheeses with cranberries, rucola and many more delicious combinations. Great Christmas dinner food! The market is easy access when coming from the Alexanderplatz or Friedrichsstraße. Neighbouring Christmas markets are the Roten Rathaus and the Opernpalais. Open every day from eleven until ten from the 22nd of November until the 31st of December.